Children love to be online, be it via PCs, smartphones, or tablets. It’s not hard to see why: the Internet is a fountain of knowledge and fun, if used wisely. It can also turn into a dangerous thing if parents don’t keep an eye on their kids’ activities in the world wide web. With cyber attacks becoming more and more frequent and more threatening each passing day, it’s very important to keep children protected against them. 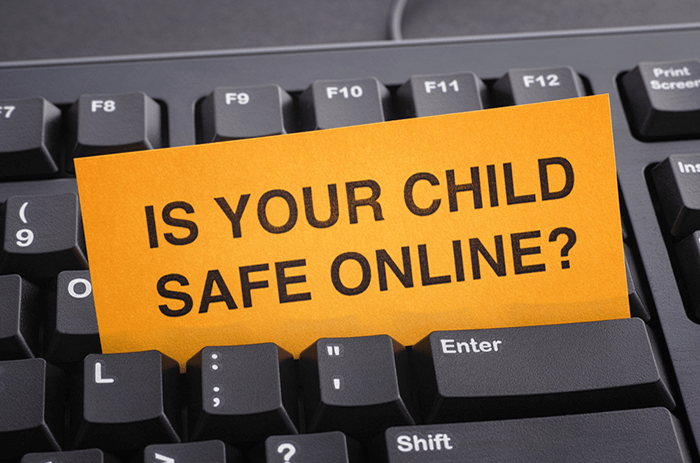 Internet safety should be a constant in the life of every parent with one or more kids. Protecting them from online threats must be a priority 24/7, 365 days a year. If you’re not careful, your child’s privacy can and will be gravely affected, resulting in dangerous consequences that can last a long time. Worry not: we’re here to tell you how you can protect your kids online. If you allow your child to have a PC in their own room, you won’t be able to see what they’re doing on the Internet unless you’re in the same room as them. Gently tell her or him that it would be better if the device was placed somewhere where you could easily see what websites they visited and who they interacted with. Let your kid know that you’re doing this so they can be safe from harm caused by malicious people. Make them understand that it’s not an invasion of privacy and that you won’t act like a hawk constantly looking over their shoulders to see what they’re up to every second of every day. One of the best ways to make sure your child’s safety comes first when they’re using a device is to use a strong antivirus. Our suggestion is to install Internet security software which is equipped with parental controls. This feature keeps a very close watch on every potential threat that might affect your kid when they’re online. Do you own a Mac? You need to set up a couple of managed accounts to protect your kid. They’ll work wonders with your laptop’s parental control options. What advantages will you get? For one, you’ll be able to put a limit on the files your child can access. You also have the option to control the websites and apps that he or she visit and use. Last but not least, with managed accounts you can have full control on who emails or messages your kid. Creating a different password for every account your child has on the Internet can be a waste of time. Plus, they need to remember each of them every time they log in to Facebook, Instagram, and so on. While that’s certainly true, using the same password for every social media account is very dangerous. Your kids will be vulnerable to all those cyber criminals who can’t wait to steal sensitive data and ask for a ransom afterwards. If you’re having trouble creating and them remembering a ton of passwords, look for a password manager. You’ll find plenty of really good ones! A web filter is a very important security tool if you won’t want your kids to land on websites which contain dangerous words or activities. Your broadband provider should already have web filtering tools that can be used for free on your devices. A Virtual Private Network, or VPN in short, is one of the most useful inventions for every gadget owner who goes online. Every time you use one of these private networks, hackers will have to spend a lot of time tracking your location and gaining access to your kid’s computer. A VPN is used to connect one PC to others via secure offsite servers. Connections are always encrypted and, as such, cyber criminals won’t be able to easily steal crucial information. Setting a password for the router you use is crucial if you want to ensure your children’s safety when they use your computer. Never rely on the router’s default password. Also, make sure that, when you create one, it’s difficult to guess by your kid(s). If you use smartphones running Android or you’re a fan of Apple devices, ScreenTime is a great app to have. It lets you keep a close look at your kid’s search and web history, as well as monitor your computer remotely. Install the premium version if you want to have access to more complex security options, such as the ability to block the device after bedtime/during school hours, the option to block apps, and to add daily time restrictions. Other great apps are TeenSafe, Mobile Guardian, and MMGuardian. When a kid starts to use chat rooms, forums, social media, and so on longer than a couple of hours, you need to step in. See what they’re talking about, to whom, and for how many hours, but do it in a way that they won’t feel guilty about it. Explain to them that limiting and monitoring the time they spend on the Internet is for their own safety. Thankfully, there are many of them to choose from. Safe Search Kids, Kidtopia, Zoodles, and Kiddle are only a couple of them. Do you use Chrome on your PC? Then time to set up something known as “supervised profile.” The latter can efficiently restrict the websites your child visits, show you which ones they are, and block search results that are explicit. Information is power, so make sure you tell your children that the Internet isn’t always the safest of places. There are many cyber criminals who can’t wait to get access to important files, addresses, location, and other sensitive information. Tell them to be careful when talking to someone they don’t know in an online discussion board. If that person starts asking personal questions, your kid should come to you and tell you about it instead of giving an answer. Also, if a child receives an email with a link attached to it, they should know better than to click on said link. The websites they visit should always feature a lock icon and HTTPS in the address field. Ads should never be clicked on, either, and the list goes on. In case someone they just met on Facebook or Twitter asks for a face-to-face encounter, they must say no. Tell your kid everything about the safest practices when they’re online and they’ll know how to react to a potential threat. Apart from creating a password for your router, you should also set up WPA security for it. WPA stands for Wi-Fi Protected Access. It is a security certification and security protocol which protects PC networks. If your kid knows their way around technology and computers, they can easily download special software which can quickly hack the password of your PC’s router. Having Wi-Fi Protected Access stops your child from going online without your explicit permission. Same if they wish to open the Internet via an account that has zero protection in place. Don’t postpone those updates that your computer keeps telling you about. If your kid uses a device that hasn’t seen an update in months, they’ll have to deal with many online dangers. Updates come with many security patches that are indispensable to your gadgets and to your kid’s safety. A so-called dumb phone is the sort of device that’s the complete opposite of a smartphone. It basically only has the most basic features, like calling, answering calls, and sending/receiving messages. They’re perfect for kids under five years old. Here are some of the best examples: Sonim XP5s, Light Phone 2, and Nokia 3310.